Last November, the Indian government announced that it will spend approximately $1 trillion (US dollars) on infrastructure over the next 5 years, with about 40% coming from the private sector. While India is seen globally as a technology giant, the country is dealing with decaying highways, unreliable bridges, and a power grid system so poor many businesses have to run their own power generators to make sure they have electricity during working hours. 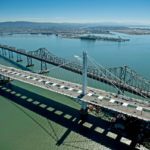 The problem has not been lack of money, but rather a shortage of civil engineers who have the expertise to make sure projects are done on time and up to specifications. This fact underscored a theme heard over and over again during a visit to India by an ASCE delegation led by President Gregory DiLoreto, P.E., P.L.S., D.WRE, F.ASCE. Over 10 days in August, the delegation conducted an intense schedule of meetings with industry executives, government officials, consultants, construction consortia, academia – including faculty and students – and members of the ASCE India Section. According to Executive Director Patrick J. Natale, P.E., CAE, F.ASCE, who accompanied DiLoreto along with Director of International Relations Meggan Maughan-Brown, MPA, CAE, CMP, Aff.M.ASCE, the Society has annually undertaken presidential visits to meet with our colleagues around the world. “Our mission this year was different,” Natale says, “in that we went abroad focused on meeting potential business partners such as consultants, or people in academia or government agencies, who we found have a strong desire to partner with ASCE. At the first stop of the global strategy mission, New Delhi, the ASCE delegation met with the Construction Industry Development Council, a joint collaboration between the Indian government and private construction industry. Council leaders shared their concerns over the gaps in skill sets of Indian civil engineers and the quantity and quality of the pool of engineers in the future. After signing an Agreement of Cooperation with the Institute of Civil Engineers (India), that organization’s leadership described the problems associated with their labor force, of which only 53% have “primary education.” They outlined their goal of developing a large well-trained labor force by 2022. To accommodate that, the 2 groups discussed ways to partner in the development of continuing education and distance learning programs that could lead to an accreditation and certification program. While in New Delhi the ASCE delegation met with the Delhi Metro Rail Corporation (DMRC), which is constructing a two-phase, $6.8 billion metro system in the city that is targeted for completion in 2021. When finished, the DMRC estimates that the system will carry over 2.3 million riders a day. The delegation also met with the president and general secretary of the Institution of Engineers, India, which represents 1.4 million engineers across 15 separate engineering disciplines. They invited Pres. DiLoreto to deliver the keynote address at their next Indian Engineering Conference in New Delhi, December 20-22, which India’s President, Pranab Mukherjee, is scheduled to attend. One of the highlights of the global mission was a special meeting in New Delhi with the leadership and members of ASCE’s India Section, the Society’s largest international Section, having over 3,000 members. DiLoreto, who was honored by chairing the meeting, administered the oath of office to the recently elected leadership and welcomed other new members in attendance. Both DiLoreto and Natale made presentations on ASCE’s sustainability and infrastructure initiatives and about taking a leadership role in public policy. Among the popular topics of discussion was how members can get enhanced value from membership in ASCE and the India Section. “This is a strong Section with dedicated leadership who express a desire to have closer ties with ASCE’s domestic program,” says DiLoreto. Before leaving New Dehli, the ASCE delegation held meetings with officials from Stanley Consultants, Larson and Toubro, the India Geotechnical Society, the Delhi Technological Institute (which wants to start an ASCE Student Chapter), the Indian Institute of Technology Delhi, and the Intercontinental Consultants and Technocrats, who invited ASCE to participate in the International Road Federation Conference in New Delhi, October 3-5. “One of the student leaders at [the Delhi Technological Institute] was so enthusiastic that he said he was going to send the ASCE website link to all of the civil engineering students at the university [so they could] join ASCE,” recalled DiLoreto. In Mumbai (previously known as Bombay), the delegation was welcomed by the National Institute of Construction Management and Research (NICMAR), which was very upbeat about the proposition of a collaboration between the 2 organizations. One outcome of the meeting is that NICMAR, which is an academic and research university, expressed interest in receiving more information about ASCE’s ExCEEd workshop program. While they represent all construction management programs and not just civil engineering, NICMAR did express interest in partnering with ASCE on issues related to disaster response, sustainability, and codes and standards. Also on the agenda in Mumbai was a meeting with the Louis Berger Group Inc., headquartered in Morristown, New Jersey. The ASCE delegation met with the firm’s International Head of India Operations and received a tour of the pilot monorail project they are developing. Among the topics discussed was Mumbai’s pressing water and wastewater needs. The final stop in India took the delegation to Kolkata (previously known as Calcutta), where DiLoreto was invited to speak to students at Bengal Engineering and Science University. Later, the delegation met with the vice chancellor, his faculty, and senior staff. The India journey concluded with a dinner at the Bengal Chamber of Commerce and Industry, attended by local business leaders and government officials. 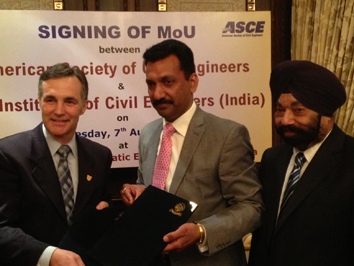 The meetings identified 3 potential initiatives which could lead to a second delegation to India in late October: the development of continuing education training and certification programs, and a modified ASCE Partners Program, which would allow Indian mid- and large-sized organizations to craft unique programs to deliver ASCE products and services at exclusive rates.